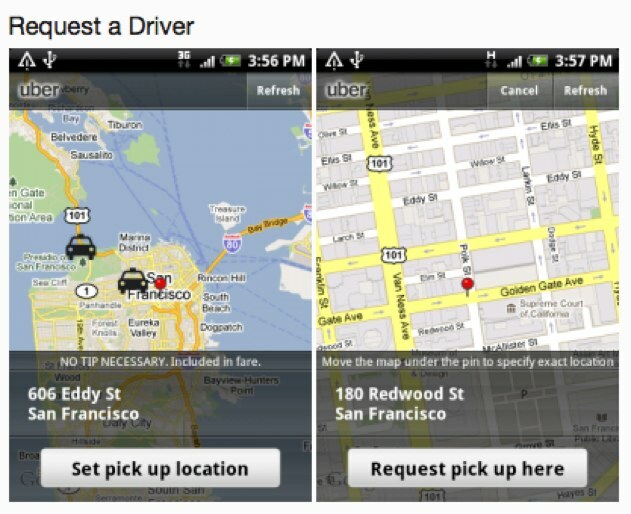 From the company formerly known as UberCab, comes the Uber Android app. On Wedesnday, the on-demand car service unveiled the Android version of its increasingly popular (and controversial) iPhone app. The Android app features the same basic functionality: you can request service, set your pick-up location, track the driver, pay for your ride, and rate and share your experience. However, the startup did take advantage of the Android environment by tweaking some UI elements, according to Uber’s CEO Ryan Graves. The Uber team started testing the Android app roughly three weeks ago, but likely got distracted by an unexpected cease and desist order from the SF Metro Transit Authority & the Public Utilities Commission of California, delivered on October 20th. Among the concerns, which you can read here, the order claimed that UberCab was marketing itself as a taxi service (by using the term “cab”) and did not have the proper permits and licenses to be conducting business in the manner that it was. Since the order, UberCab has officially dropped the cab (even its website url is now uberapp.com) and the service is working with authorities to stay in business.